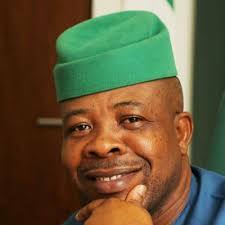 Imo State governor-elect, Emeka Ihedioha, on Wednesday was officially recognised by the Independent National Electoral Commission (INEC) as the winner of the 2019 governorship election in the state as he was issued a Certificate of Return by INEC. the move trigged wild jubilation as people followed his convoy singing and dancing, resulting to a heavy gridlock on major roads in Owerri, the state capital. Receiving his certificate has put to rest speculations that INEC would bow to the two-third of the 18 local government areas gimmick which was flying in the air. Certificates of return were also issued to elected state House of Assembly law makers. However, speaking shortly after receiving his certificate of return, Ihedioha promised to focus on getting the state back on track rather than looking for who to probe. Ihedioha also promised to setup a transition committee that will liaise with stakeholders for the smooth function of his administration while relying on separation of powers for efficient running of the government. He, however, commended INEC and the security agencies for ensuring the success of the election despite the few challenges associated with.